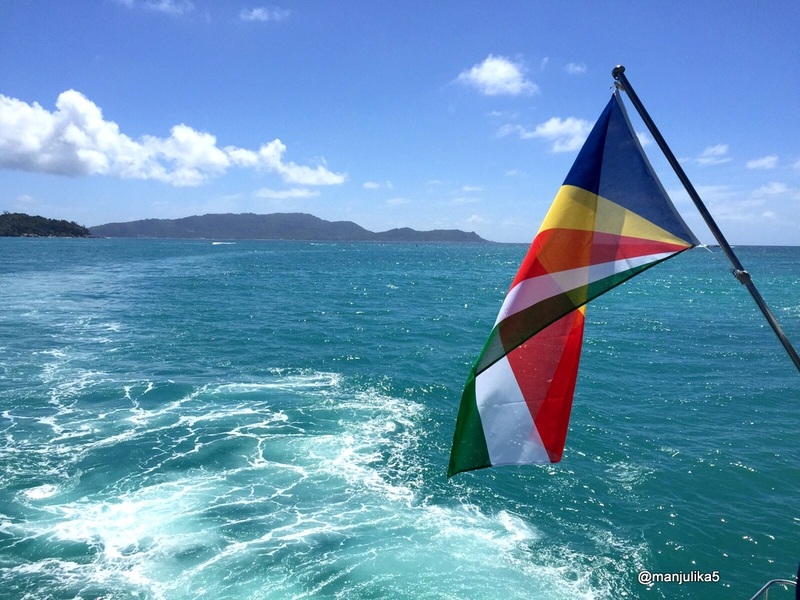 This blog post is happening because I have some awesome pictures that have freshly arrived from Seychelles, one of the most loved island destinations. The pristine water is so alluring and the giant tortoise are so fascinating. My friend Asha is in Seychelles these days, not for a personal holiday but for a work assignment that has kept her there for a month. Lucky her, Isn’t it? Well, in one of my earlier posts I did mention that consultants can give a real good competition to travel bloggers, now you know why I said that. No doubt, these people live a life out of suitcase but trust me they get to travel to some of the amazing places of the world. This cottage calls for a big family holiday, watsay? So here is a little byte around Seychelles. Mind it, its more than just a small dot on the Indian Ocean. According to my friend, its the best place that she has visited so far. She also told me that the locals don’t say ‘Welcome to Seychelles’ but ‘Welcome to paradise’. Do we really need to ask why? The pictures are shouting the truth. The gorgeous archipelago of 115 islands is incredibly beautiful! 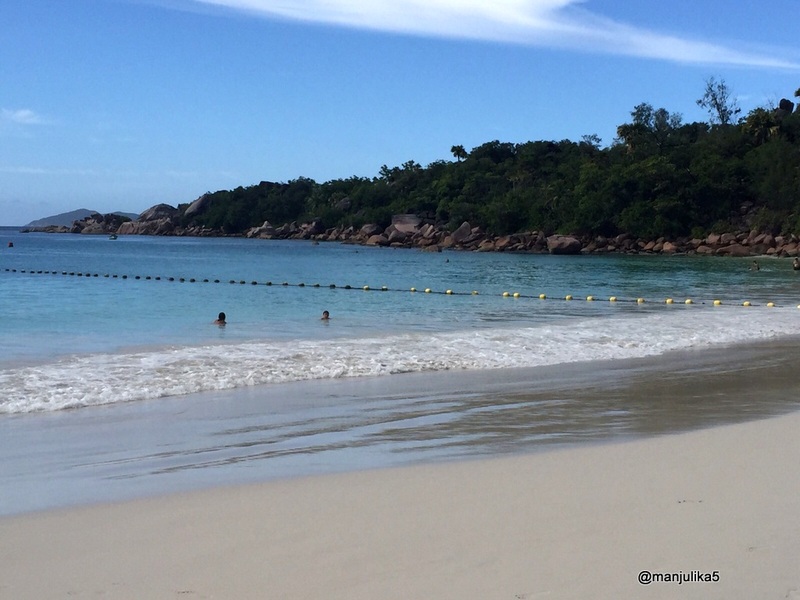 Anse Georgette on the Praslin’s beach is known as one of the most beautiful beaches in the world. Yes, it is the famous pink sand beach! 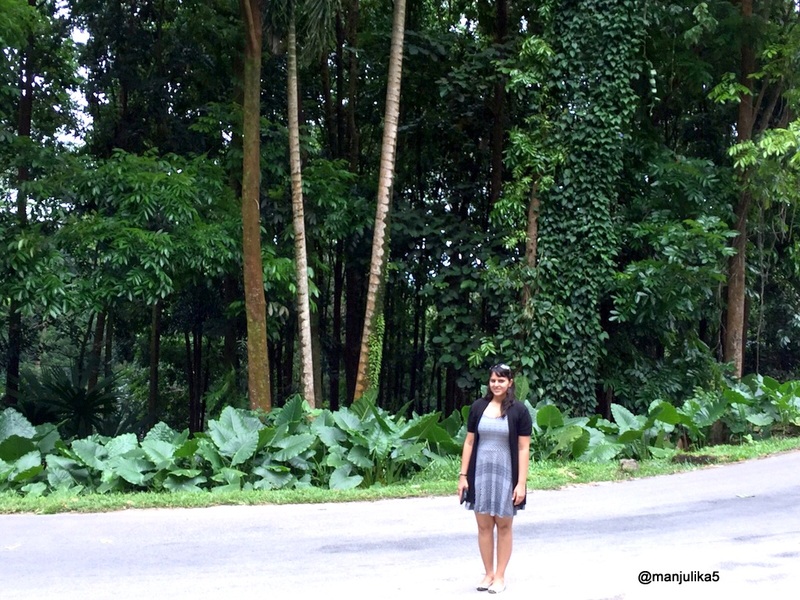 Seychelles is not just about blue beaches but lots of greenery too. Along with stunning coral reefs and rich marine life, it has a diverse vegetation with exotic flora and fauna. There are lush palm forests too. In Seychelles, you must not miss the chance of looking for black parrots. Otherwise, they are one of the endangered species but can be spotted here. 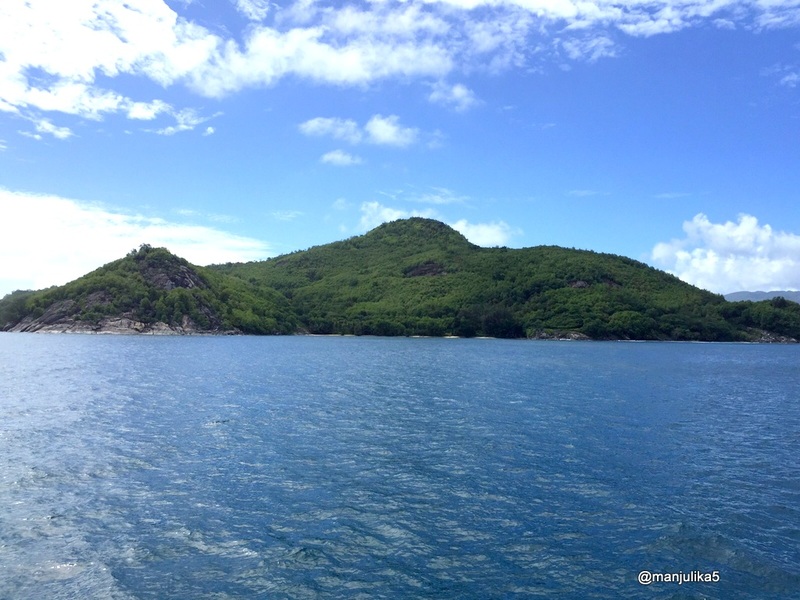 Once you are at Mahe Island, a ferry is used to take you to Praslin and then La Digue Island. Though Mahe is small but beautiful. It has some 70 beaches. Morne Seychellois National Park and the island’s highest peak, Morne Seychellois in Mahe are popular attractions. Praslin is beautiful. It is the main port of the Seychelles island. Since this picture had the country flag, I was intrigued to know the significance of the five colors. The oblique bands of blue (hoist side), yellow, red, white, and green (bottom) inspire the people to think about the future. Blue stands for sky and sea. Yellow is associated with sun and light. Red represents people’s unity and love. White is about peace and harmony. Green means flora, fauna, land and nature. Prince William and Kate Middleton chose Seychelles as their honeymoon place. No less, it had caught the eye of the Indian newly wedded when Aishwarya Rai and Abhishek Bachchan too were headed there post marriage. Now we know why its called a luxury as well as a honeymoon destination. 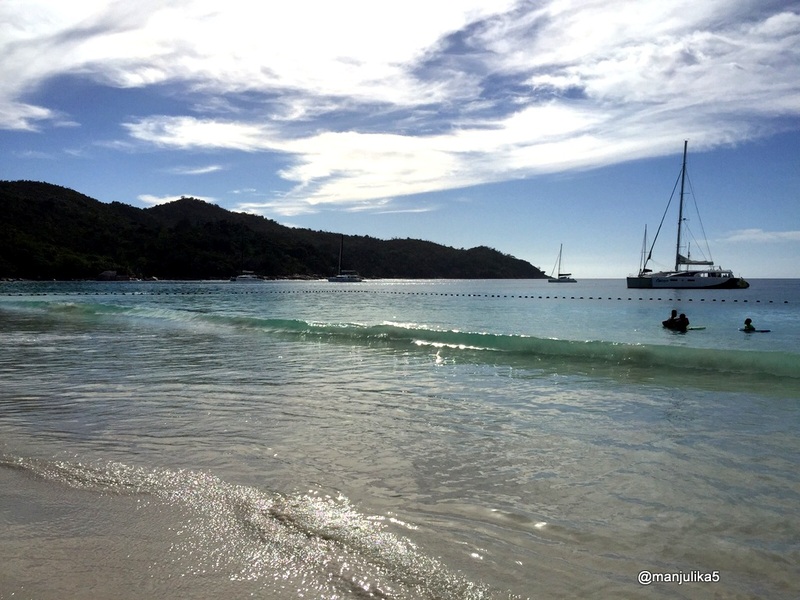 In Seychelles, hitting the beach is an obvious thing, what more…. Sip coconut water on breathtaking beaches. Go Scuba-Diving, Shark Bank is the most famous diving spot. Check out the largest and one of its kind coconut seed- Coco de Mer at Vallée de Mai. It weighs nearly 20 kg. It is known as the coco fesse, sea coconut, love nut, double coconut, or Seychelles nut,etc. Indulge in the Creole cuisine. 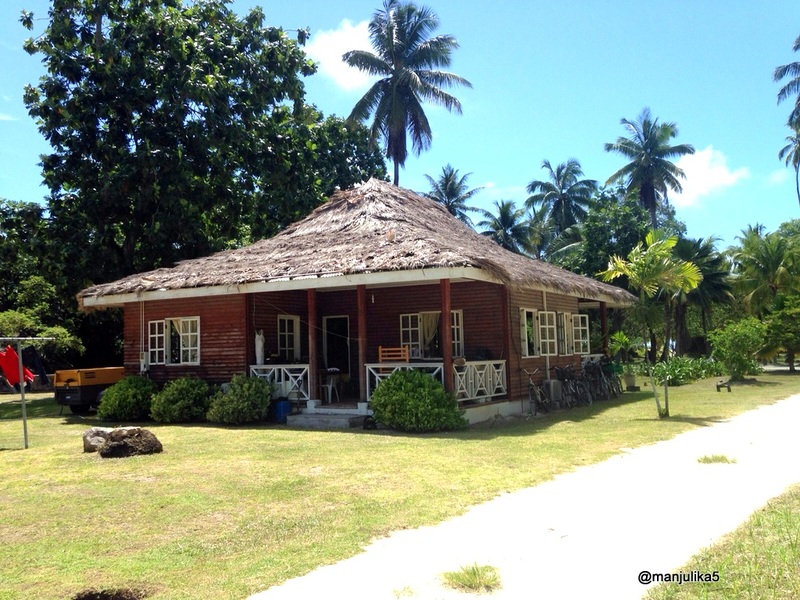 Out of 115 islands, only 16 islands offer accommodation. Not all beaches are safe for swimming. Seychelles has one of the best palatial villas and resorts. Seychelles is a visa-free country. La Digue Island allows no private cars. Taxis and hotel carts do ply but in minimal. So the only way of exploring the place is bicycle or ox drawn cart. 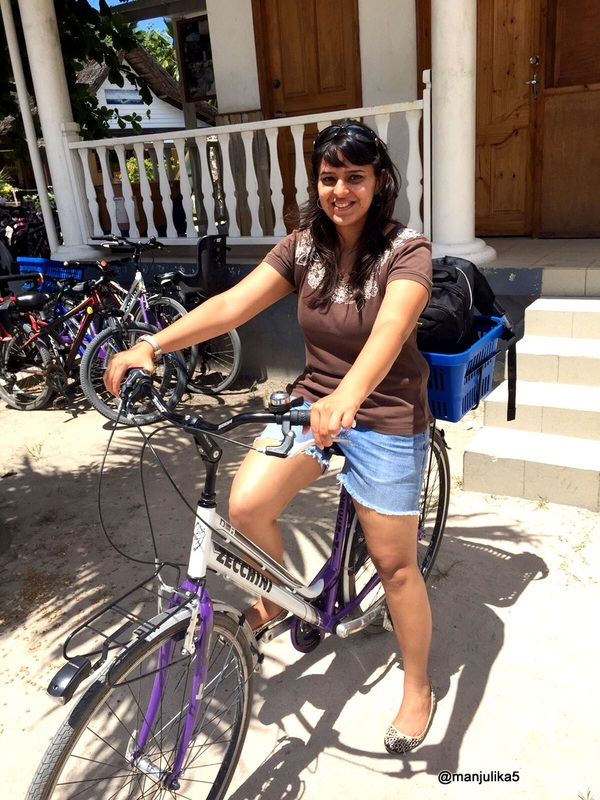 Asha rented a bicycle and went around. It costed her SCR 150. The Seychellois Rupee (SCR) is the currency of Seychelles. 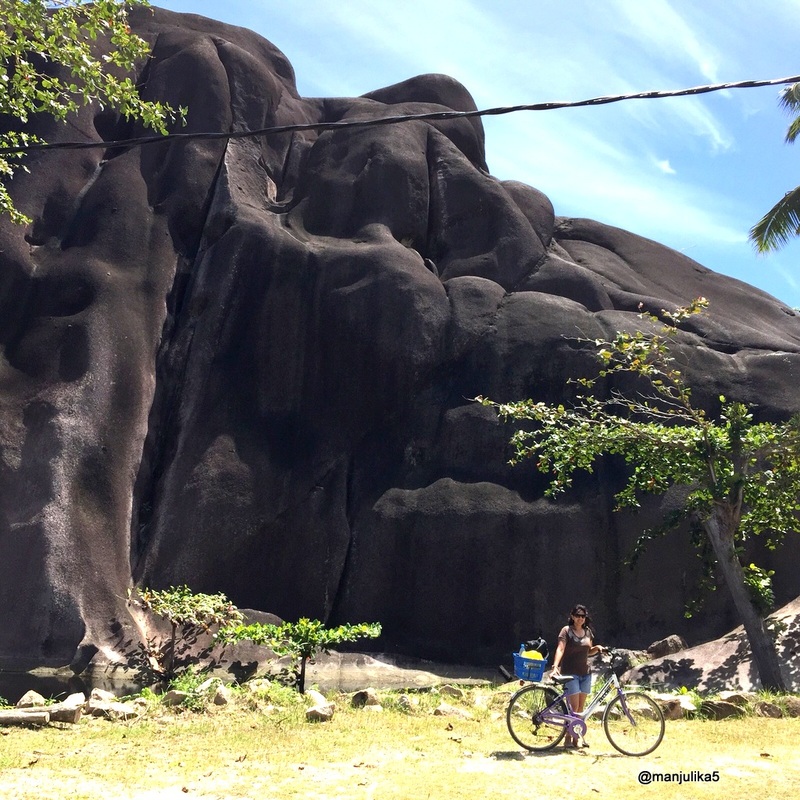 Above picture is a park in La Digue Island that has giant rock formations. These are age-old granite boulders. The second largest coral atoll in the world is in Seychelles- Aldabra. 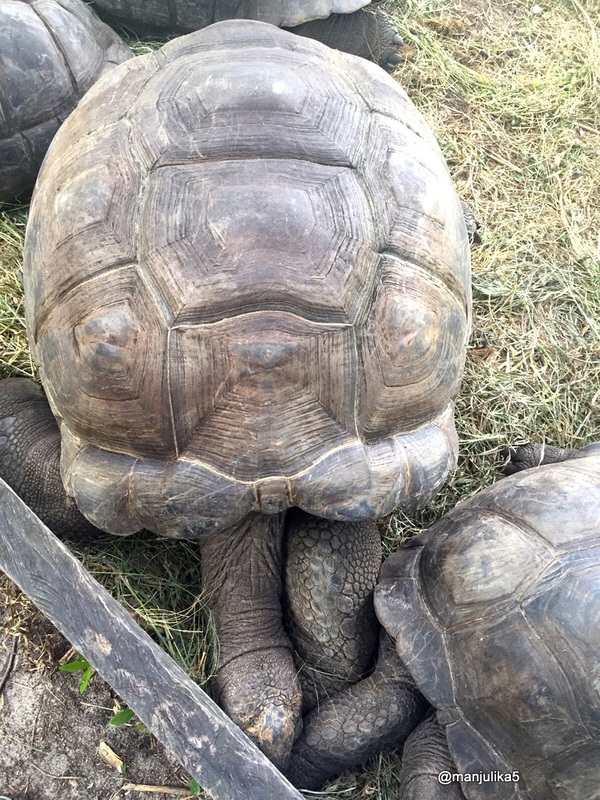 Here we find ‘Giant Tortoises’ and as the name says, they are giant. 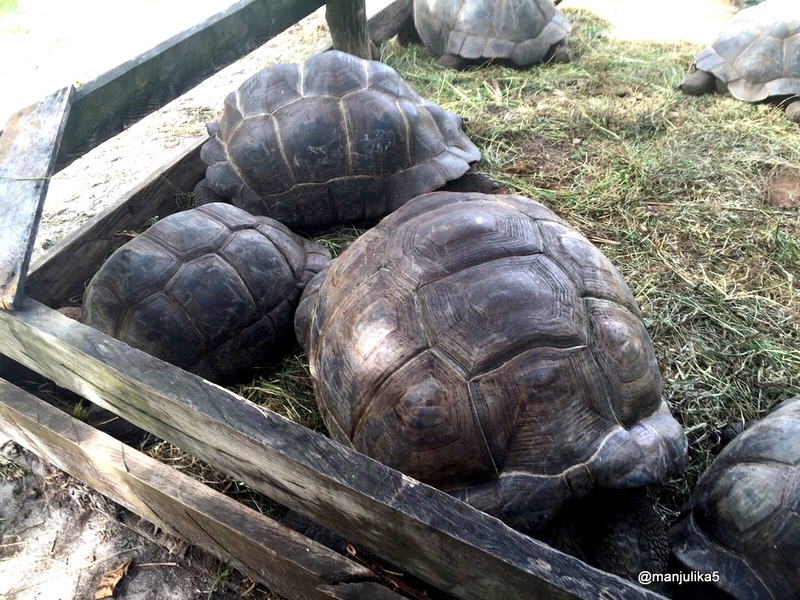 Fregate is home to a healthy population of giant tortoises. Look at them, they are so huge. Aldabra Atoll is a Unesco world heritage site. The tortoise found here are 120 cm in length. Asha did a day tour of Mahe island with Sun tour guide. 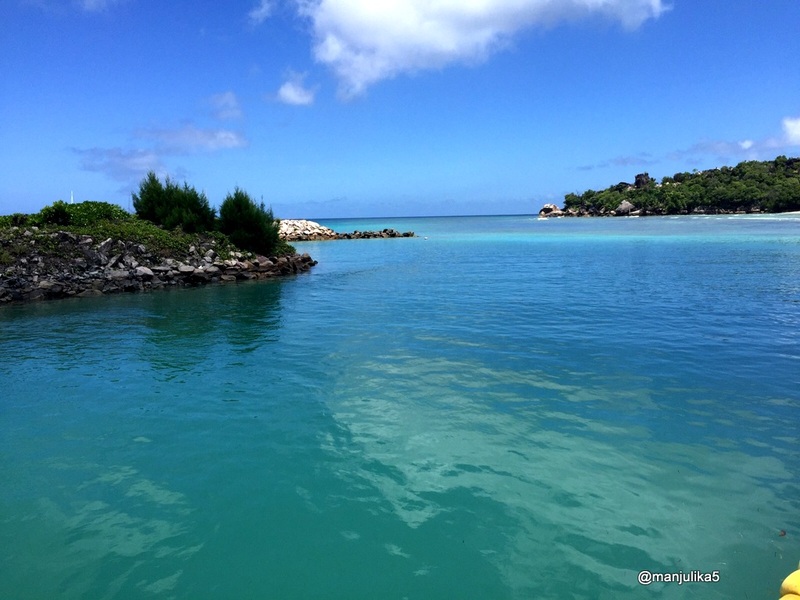 Mahe is the biggest island of Seychelles. It contains the capital city of Victoria. Victoria is a nice British colonial city. Beau Vallon is a popular beach in Mahe. Get a peek in to the life of the locals at the Victoria market. One must taste the local beer-Seybrew. Wow, these were some awesome pictures and to put them in a story, I really enjoyed reading around Seychelles. Hope I get to visit this beautiful archipelago soon. A couple of days back my friend Tushar had sent some of his recent captures of his first Autumn in Brussels. I loved the pictures, read around Belgium and made a story around it with inputs from his wife. Many of my readers told me that they loved the idea of seeing a new place through my friends eyes. It was just a compilation of lovely pictures and simple facts. Not everyone is a blogger or a writer but everyone is a photographer with a mobile in hand. Now, if I tell them to write, the blog will be postponed for lifetime but its super easy to get them talking one on one. Rest, my job is to read more and compile it together. 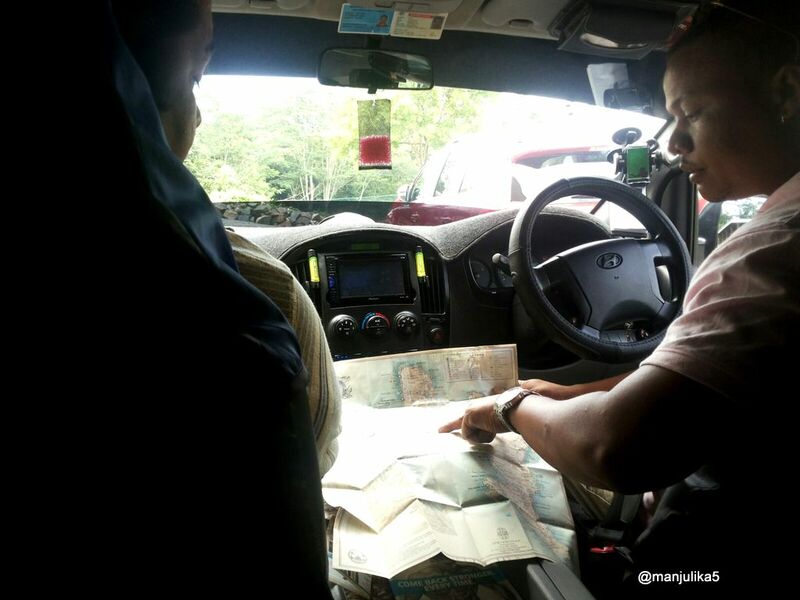 The plan is to urge more and more of my friends to share their experiences through my blog. I am glad my initiative is being appreciated and supported by my friends. Thank you Asha for such lovely pictures!! I feel so enriched after reading and sharing so much about Seychelles.